The latest batch of free content on the Epic Games Store includes the Jackbox Party Pack and Axiom Verge. As an added incentive for gamers to check out and use the Epic Games Store, free games are offered on the platform every 2 weeks. The first batch of free games included Subnautica and Super Meat Boy in December, followed by What Remains of Edith Finch in early January. Now, the next round of free games have been announced! The Jackbox Party Pack and Axiom Verge are the latest batch of games available for free on the Epic Games Store. Starting today, January 24, you can get a free copy of the Jackbox Party Pack on the Epic Games Store. The free Jackbox Party Pack offer will last until February 7, giving you plenty of time to redeem the game. After the Jackbox Party Pack offer expires, gamers will then be able to pick up a free copy of Axiom Verge starting on February 7. Similar to the availability of the Jackbox Party Pack, Axiom Verge can be redeemed for free over the course of 2 weeks with the offer expiring on February 21. To get these games, all you need to do is create an Epic Games Store account, then download the client. The free games are prominently listed at the top of the Store page. After clicking on one of the available free games, you’ll be taken to a purchase page where you can redeem the game. After that, the game will be added to your Library, allowing you to download and play whenever you like. Even if you don’t plan on playing the Jackbox Party Pack right away, it’s worth redeeming the offer because once a game has been added to your Library, it’s yours to keep forever. Along with free games, the Epic Games Store boasts several exclusive titles available for purchase like the latest game from Supergiant, Hades. With a wealth of developers bypassing Steam in favor of the Epic Games Store (thanks in large part to the company’s generous 88/12 revenue split), you can expect the list of exclusive titles to grow exponentially by the end of 2019. What do you think of the Epic Games Store? Do you plan on grabbing a free copy of the Jackbox Party Pack, or are you someone who dislikes using multiple platforms to play games? Let us know your thoughts down in the comments below! 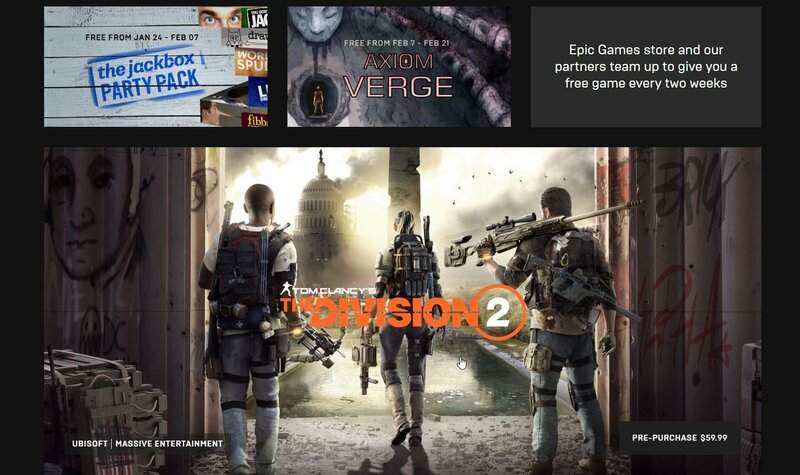 For more on the Epic Games Store, be sure to check out some of our previous features including the announcement that the Epic Games Store will offer free games every 2 weeks, additional information on the store’s 88/12 revenue split, and how Tom Clancy’s The Division 2 is skipping Steam in favor of the Epic Games Store.